DotA 6.78c Map has been release with some regular maintained changes in it. The version consist of range, cool down and some factory changes along with a new Captain Mode alteration. The following map is the 2nd sub version of DotA 6.78 series and DotA 6.78c is promoted as the Stable map the moment it was released. Description: Developer concentrates on the bugs and error fixation DotA 6.78C. Changelogs: Read Complete Changelist (Redirected) . 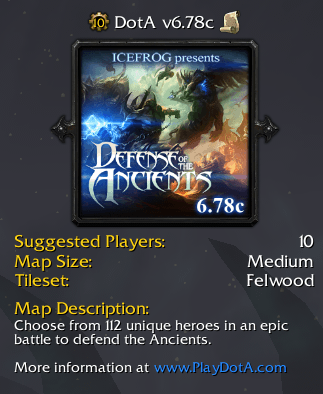 Before adding this map into your DotA please check the map file. Put the map on Warcraft III\Maps\Download folder. Always keep backup of Original Warcraft III DotA folder just for a safe side.